I got into a hot discussion with the president of the [local section of a large, national children’s sports organization] I work with, who was ordering me to send a “blast” with a link to a GoFundMe page for one of our former members who is fighting cancer and running up plenty of bills. While I sympathized with the cause, I immediately questioned whether this was an appropriate use of our email list (which I generally use only to remind folks to register for the upcoming season or to send out other very targeted information about the group’s programs). I did wind up sending the link to the whole list (about 465 entries) this afternoon, only after I made the president get approval from the board of directors (I may have been the only dissenter), and after expressing my concerns about what our list is for. I just sent my president your link, so maybe he’ll think twice about ordering me to randomly send something out that’s only peripherally related to our organization’s mission. This is why it’s vital to clearly define what your list is for, because once you establish that, you’ll be using it to briefly describe the list to subscribers: it’s the “contract” you’re forming with them before they decide to accept your terms by subscribing. 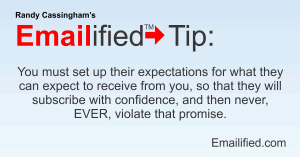 You must 1) set up their expectations for what they can expect to receive from you, and then 2) never, EVER, violate that promise. Because there’s a severe penalty for violating the subscribers’ trust: spam complaints. Whether you think it’s legit or not, when you violate the list’s purpose — such as sending charity requests when the list is for sports team updates — some portion of your readers will click the “This is Spam” button on their email interfaces. Because what was sent to the subscribers is not just a violation of trust: it IS spam, so you can expect spam complaints. You lose trust from your subscribers, who will now view any future mail from you with suspicion. Your list will likely lose each subscriber who complained. Your online reputation will suffer, which results in decreased “deliverability”. It’s possible to lose your email account, and perhaps even your web site hosting. Losing Trust: When you promised that you’re going to send information on something specific — which you defined when you set up your list — subscribers trusted that promise when they gave you their email address. Sending them anything else means you lied, and of course they will trust you less. They feel deceived, and rightly so. In the Little League case, they not only wonder about your email ethics, they wonder if they can trust you with their children. Unsubscribes: Now that you’ve proven you’re a liar and might send solicitations or other “off-topic” messages, why the hell should they stay around? And even if they don’t click the Unsubscribe link, some ESPs — certainly the better ones — will prohibit you from ever sending to that address again, even if you set up a new list with them! ESPs subscribe to “feedback loops” with large ISPs: they get copies of those spam complaints from big email providers such as AOL and Gmail, and promise that they’ll keep you from spamming their customers again, even if they later decide they actually do want more mail from you after you apologize and promise not to send off-topic messages again. This is why it’s vital to define your list carefully from the outset: even if you don’t think it’s a contract with your subscribers, they think so! And there are significant ramifications for violating subscribers’ trust. — I hope you are not speaking from experience, Randy! If you are, perhaps a brief explanation of the circumstances, and the lessons you learned, would be useful for many (most?) of us. I’ve certainly had to move my sites to new hosts before, and it certainly is a pain, but I’ve not had to do it by order of my host! I’ve not just followed best practices, but in the early days I had to create and model them.